Today we had an awesome day at the flyball seminar. Touch n Go are great, they really know their stuff, and they are also very personable and easy to talk to and work with. They give us great advice and are very tactful. Even when they tell us our dogs are overweight! But we know that and that’s okay, they have some winter fat on them. 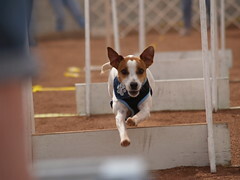 The picture to the right is of Tinker, a Jack Russel Terrier on our team that does such a great job! And, of course, I’ve been having a really fun time with my new digital SLR camera. I could just sit there and take pictures all day long of these dogs, and I’m learning how and when to focus the camera. And to the left is Apache. 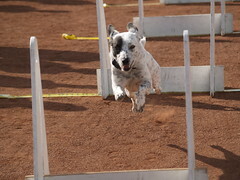 She is an Australian Cattle Dog girl that loves her flyball. She is also part of the Dazzle Dogs show that her Mom puts on. And, cool of cool… Apache is deaf! She does such a great job and has a beautiful box turn. If you click on these pictures you can see bigger versions of them. Anyway, so today we went over the basics of training the box turn from scratch. We got some great ideas and I am going to start training Chase, Muffit and Tatum to, literally, bounce off the wall in the back yard. That will be fun to do. And now that I have seen the progress the dogs follows, including just getting their front on the wall to begin with, I am really excited to start trying it. Anyway, I’ve had too much wine to drink and it’s almost time for bed anyway. And Monday we will have a long ride home, fortunately we are not driving home Sunday night. And our car insurance is all good so we should be set for our trip home! Great pictures! Looks like the dogs are really enjoying it too! Hey Jen! Yup that is them. They are great! We were not on the TV though. This was a seminar I went too.. and it wasn’t televised. I don’t know if our team will ever be on Animal Planet but it would be fun someday! Hey Lora.. yeah the dogs had fun as well, but they would haven like to have run more. Hey Jen! Yup that is them. They are great! We were not on the TV though. This was a seminar I went too.. and it wasn't televised. I don't know if our team will ever be on Animal Planet but it would be fun someday! Oh man! I wanta do this flyball thing! 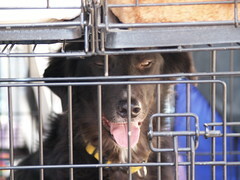 Perfect Tosca’s last blog post..I’m An Honorary Sheepdog! Great pics! Looks like loads of fun!